Thanksgiving is a favored holiday among many Americans, because it is a day of feasting, family and football. Let’s not forget the obvious reason for the holiday: giving thanks! In tribute to the earnest purpose of celebrating on Thursday, Nov. 24, I have identified five foods to be thankful for. These five foods were chosen based upon their ORAC value, or oxygen radical absorbance capacity, which is a measurement of the antioxidant capacity of a food. Antioxidants are known to decrease inflammation and prevent damage from free radicals in the body. If we recall from chemistry class “LEO says GER,” the process of oxidation is when a molecule “loses an electron” and thus creates a free radical (the freed electron). These freed electrons can wreak havoc in the body, all of which increase inflammation. Therefore, antioxidants make these oxidized molecules more stable by donating an electron and thus decrease inflammation and prevent damage. The primary source of antioxidants is the food we eat, specifically foods high in vitamins A, C and E, as well as the variety of colorful phytonutrients. There are several foods to be thankful for, but we have good reason to be thankful for the health benefits and disease-fighting potential of the following foods. ORAC values are provided in micromoles of TE, or trolox equivalents per 100 grams. Since 100 grams of each food may not be an appropriate serving size, I have converted the ORAC values to reflect 1 serving. Berries are highly touted for their antioxidants, which can be attributed to the phytochemicals in their dark coloring. Anthocyanins, proanthocyanidins, tannins and flavonols provide blueberries with their dark blue color and their ability to reduce inflammation and possibly even prevent cancer cell development. Blueberries also contain reservatrol, which has made red wine and red grapes famous. There is no doubt that blueberries lead the berry pack in terms of antioxidants. Artichokes can be intimidating if you’re not familiar with them, but their savory centers make the preparatory work worthwhile. Artichoke hearts are prominent in Mediterranean cooking and can be delicious in a dip or eaten alone. Cynarin is found in an artichoke’s pulp, and when eaten with others foods or water it can make it taste sweet. Cynarin and other components of artichokes are known to improve digestion and liver health because they increase bile flow and gall bladder function, benefit gut bacteria and act as a diuretic. Researchers also suggest that artichokes may lower cholesterol by inhibiting HMG-CoA reductase activity. 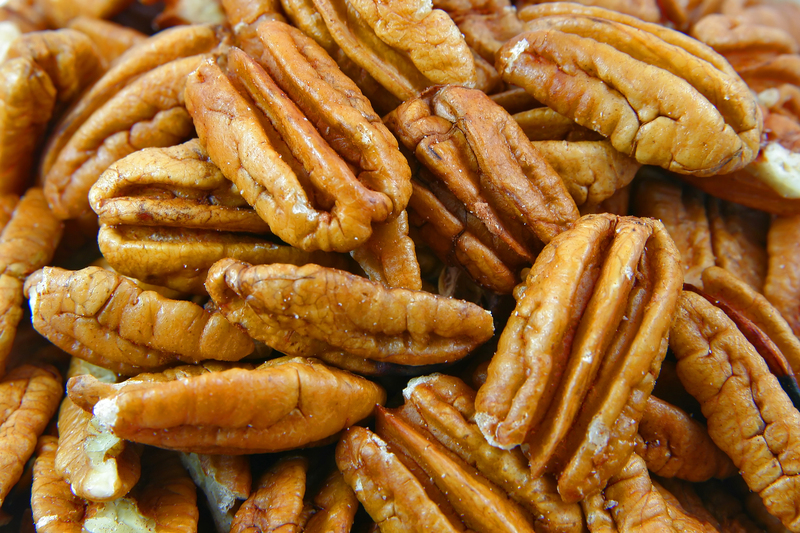 Walnuts and almonds may have the most omega-3 fatty acids, but pecans are the best source of antioxidants. Also, like other nuts they are high in fiber, vitamin E, quercetin and campferol. The antioxidants and plant sterols in pecans may lower LDL cholesterol, decrease gallstones and prevent age-related muscle nerve degeneration. Similar to other beans, the small red bean is good source of carbohydrate and fiber and a vegetarian source of protein. This type of bean is also known as an azuki bean made famous by red bean paste in Asian cuisine. It is also high in iron, selenium, folate, thiamine and vitamin B6, as well as zinc and copper. Surprisingly, most beans — including broad beans, kidney beans, black beans and many others — also have high ORAC values. Cloves are dried flower buds with a potent scent and flavor. They are a native spice in Indonesia and are harvested primarily in the Indonesian islands, India, Madagascar, Sri Lanka and Pakistan. Cloves are commonly used to decrease intestinal gas via their carminative properties. Cloves increase HCl in the stomach and improve peristalsis by decreasing pressure in the intestinal tract, beginning in the esophagus. They are also proven antiseptics and help to reduce toothaches and may even prevent dental infections. This spice is also commonly used in ayurvedic medicine as a warming agent. These foods are just a few to be favored. We know that there are hundreds of other “super foods” that are also high in antioxidants and help to prevent disease. If these foods are new to you, I encourage you to experiment and find a way to incorporate all of these valued ingredients in your favorite recipes! Written by Cassie Vanderwall, MS, RD, LDN, CPT, an outpatient dietitian who works in the Nutrition and Wellness Center at Rush University Medical Center.